The field of human genetics is being revolutionized by exome and genome sequencing. A massive amount of data is being produced at ever-increasing rates. Targeted exome sequencing can be completed in a few days using NGS, allowing for new variant discovery in a matter of weeks. The technology generates considerable numbers of false positives, and the differentiation of sequencing errors from true mutations is not a straightforward task. Moreover, the identification of changes-of-interest from amongst tens of thousands of variants requires annotation drawn from various sources, as well as advanced filtering capabilities. We have developed Highlander, a Java software coupled to a local database, in order to centralize all variant data and annotations from the lab, and to provide powerful filtering tools that are easily accessible to the biologist. Data can be generated by any NGS machine, (such as Illumina's HiSeq or MiSeq, or Life Technologies' Solid or Ion Torrent) and most variant callers (such as Broad Institute's GATK). Variant calls are annotated using DBNSFP (providing predictions from 6 different programs, splicing predictions, prioritization scores from CADD and VEST, and MAF from 1000G and ESP), ExAC, GoNL and SnpEff, subsequently imported into the database. 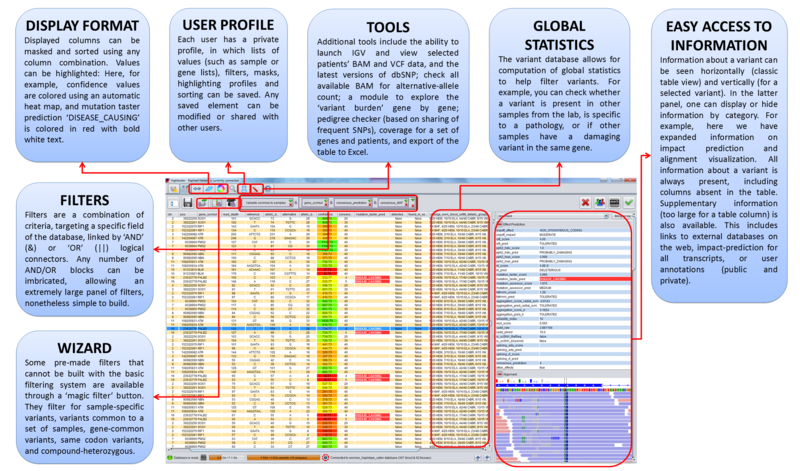 The database is used to compute global statistics, allowing for the discrimination of variants based on their representation in the database. The Highlander GUI easily allows for complex queries to this database, using shortcuts for certain standard criteria, such as "sample-specific variants", "variants common to specific samples" or "combined-heterozygous genes". Users can browse through query results using sorting, masking and highlighting of information. Highlander also gives access to useful additional tools, including visualization of the alignment, an algorithm that checks all available alignments for allele-calls at specific positions, and a module to explore the ‘variant burden’ gene by gene. 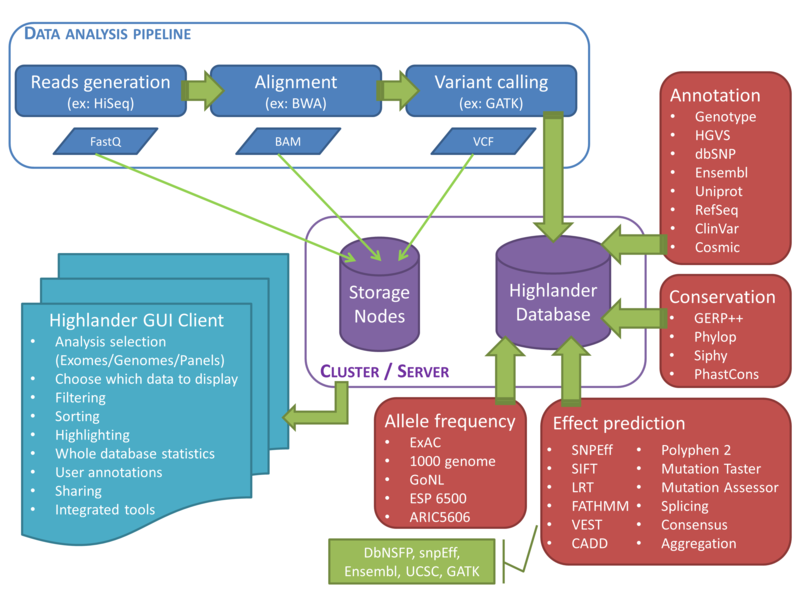 The Highlander client comes with a standalone embedded database with public data from 1000 Genomes (chr22 of 80 samples). To test Highlander using this dataset, download the client and select the "demo" settings (instead of "default") in the dropdown list that appears when lauching Highlander. Enter 'demo' as login and leave password field empty. Highlander is also used by genetic centers of Hôpital Erasme (Brussels, Belgium) and Universitair Ziekenhuis Brussel (Brussels, Belgium), as well as in the BridgeIris project (http://bridgeiris.ibsquare.be/).